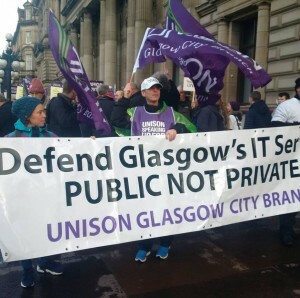 NSSN 319: Support Glasgow Unison ICT workers – stop privatisation! Glasgow Labour council are attempting to recruit a scab temporary workforce to cover for striking ICT Unison members during their action against privatisation. This declaration of all-out war and goes against every principle of trade unionism. The leaders of Glasgow City Unison and their 10,000 strong membership are being specifically singled out for attack by council officials and the Labour leadership. This is not a surprise as Glasgow Unison have been intransigent and uncompromising over a number of years in defence of members terms and conditions, pay and in opposition to Labour’s implementation of Tory austerity in the city. The privatisation of ICT is linked to the huge cuts Labour have implemented in the city with tens of millions more planned for early next year. Glasgow Labour’s action would set a precedent for all other public sector employers to act in the same way when faced with a strike of workers fighting privatisation and cuts. Therefore this is fight for every trade unionist to engage in. Unison Scotland Council and the Unison Labour Link have backed Glasgow City Unison’s campaign against ICT privatisation. To send motions to local constituency Labour parties condemning the actions of Glasgow City Council and demanding the withdrawal of these attempts to break a trade union strike and the plans to privatise ICT. Crossrail action in defence of victimised union rep – In response to a campaign by Unite to demand a second tier productivity bonus for electricians on Crossrail in London, which included an unofficial walkout on 25 November, notorious blacklisters Laing O’Rourke/Crown House has issued the Unite rep on the site a transfer to another job off the project. From 5 December, Terry Wilson was set to be off Crossrail, in a blatant attempt to intimidate workers, just as Unite starts a consultative ballot on the bonus payment and other demands. 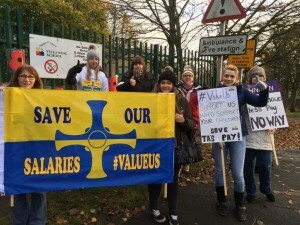 As a result of this victimisation, on 30 November and 1 December electricians ‘cabined up’ and refused to start work. Then on 2 December, they picketed the site. Following this, workers were issued with a letter from Laing O’Rourke, ‘encouraging’ them back to work by threatening disciplinary action! But the electricians were back outside the site at the start of this week, fighting to get Terry back onto the site and Unite will be outside every day from 6.30am. We overheard workers who had been meant to install the lifts saying they were being sent home because the electricians weren’t working! It is crucial that this dispute is won and it can be – not just for the Tottenham Court Road site but the whole campaign across Crossrail. A victory here would really build confidence that they could force Crossrail management to concede the bonus. CONFIRMED: ”Carlo Neri’ who spied on picketlines was an undercover police officer. That the Parliament notes the recent demonstration by the construction workers’ union, UCATT, at the site of the new £212 million Dumfries and Galloway Royal Infirmary in response to the reports that the principal contractor, Laing O’Rourke, has refused the union access; believes that this company has previously prevented union access from other publicly-funded infrastructure projects; understands that it was a member of the Consulting Association, which was reportedly involved in the blacklisting of construction workers; believes that the Scottish Government expects companies that are awarded public contracts to maintain high standards of business and professional conduct; considers that this type of activity by a contractor toward trade unions undermines the remedial steps called for in the government’s procurement note on blacklisting, does not support the aspirations of the Fair Work Convention to promote a fair and balanced economy and undermines workers’ rights and increases exploitation, and supports the freedom of trade unions to organise and represent workers across the economy. Thank you to Salford TUC, SNP Trade Union Group, PCS Independent Left, Unite Liverpool construction branch for invites in the past few weeks. Thank you John Bryan and Steve Acheson for representing. “I was blacklisted after a safety dispute at Pfizers in Kent. I was repeatedly sacked from jobs time and again. I appeared in the Royal Courts of Justice over terrorism. The High Court was not a full victory that blacklisted workers deserved. I will be relentless until we get justice”. Shrewsbury Pickets have engaged Mike Mansfield QC who has submitted papers to the Court of Appeal against the continued refusal to release the official government papers for the Shrewsbury trial. 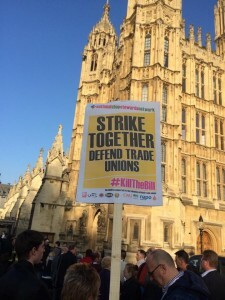 ← NSSN 318: Crossrail walkout – the Sparks are back!